One of the things I like about 1950's and 1960's watches as they often have really unique dials. You have to see them in person. The catalog images just don't do them justice. Take for example, the 1961 Viking II. It was produced through 1963. It's catalog image is pretty plain jane. 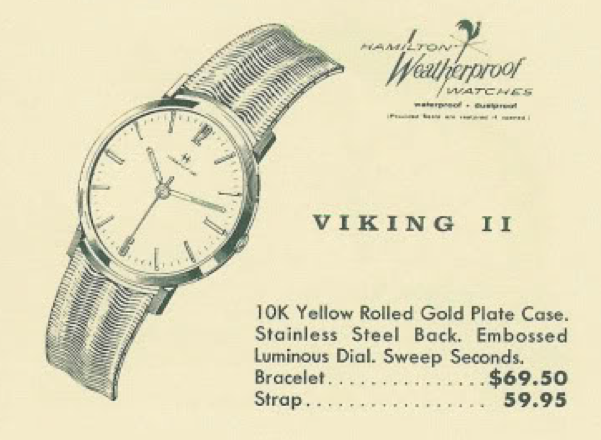 The Viking II was part of the entry-level line of Hamilton watches. It came in a one-piece case with a 10K rolled gold plate bezel and stainless steel back. Tucked inside is a Swiss-made Hamilton 688 movement, made by ETA. I recently purchased Viking II project watch. It was missing the crown and not running but I was hopeful that I could resurrect it. Check out the funky patterned dial though - that's not evident in the catalog snip. The one-piece case opens through the crystal so you need a special tool to get inside. If the crystal is in good shape and the gaskets in the crown are new, then the watch was considered "waterproof". Since there's no crown and stem in place, the movement just drops right out once the crystal is out of the way. If the 688 looks familiar, it's made by ETA, who also made several of the automatics used by Hamilton during the 1960's. Once the rotor on an automatic is removed, it looks just like this manual winding 688. While everything is being cleaned, I'll prep a new crown and male stem to go onto the case. The male stem is what allows the movement to be loaded from the front. It will need to be shortened so that it's in just the right spot to engage the female portion of the stem that's in the movement. The newly cleaned and oiled movement goes onto the timer to see how it's running. This one's not too bad, right out of the chute. However, this type of movement is very easy to adjust the beat rate (speed) as well as the beat error. My picture is a little out of focus but you can see that I was able to tune the beat error down significantly as well as slow the watch down so it runs just 4 seconds fast per day. A new crystal and new strap completes the restoration. The dial has a swirl pattern that looks almost like a scallop shell. The reflections change as the angle of the watch changes. Unfortunately, a little moisture go into the case over time and compromised the lacquer on the right side near the 2 and 3 hour markers but otherwise this watch really turned out great.